Germany’s Federal Data Protection Commissioner issued clear criticism against the government’s bill on data retention, saying it not only amounts to a disproportionate violation of Germans’ basic civil rights, but also those of Europeans. EURACTIV Germany reports. The German government’s bill is “still not capable of” alleviating “considerable doubts regarding the general constitutionality” of data retention in telecommunications traffic, the Federal Data Protection Commissioner Andreas Voßhoff wrote in a 31-page position paper. The bill intends to allow retention of connection data in telephone and internet communications for all citizens and systematic storage for 10 weeks, without any suspicion. An earlier regulation on retaining data for six months was overturned by the German Constitutional Court (BVerfG). The same happened to a similar EU regulation before the European Court of Justice (ECJ). The revision, with shorter retention periods, is intended to account for previous concerns indicated by the judges. But Voßhoff has a very different view. In her position paper she writes that the bill does not completely comply with the conditions outlined by the BVerfG and the ECJ in their decisions on the constitutional organisation of such measures. Voßhoff argues that a “brief and unconvincing argumentation simply ignores” the ECJ’s first explanation indicating the disproportionality of the provision’s interference with the basic right to respect private and family life in Article 7, and protect personal data in Article 8, of the European Charter of Fundamental Rights. This seems even more troubling considering the ECJ emphasised the outstanding importance of these fundamental rights on several occasions, she said. Furthermore, the bill does not take into account the fact that the BVerfG only permitted unjustified retention of telecommunication data in certain exceptional cases, Voßhoff writes. Due to widespread retention of IP addresses, a “very extensive data pool” is being created because of the provisions in the bill, she points out. But at the same time, security agencies already have “far-reaching access options”, such as for IP addresses. Furthermore, Voßhoff says, not only has the current discussion on the “NSA” unquestionably revealed that comprehensive surveillance of internet traffic does not pose a problem for intelligence agencies, but that it actually takes place. Voßhoff also issued harsh criticism against the legislative procedure. “Guidelines of the Joint Rules of Procedure of the Federal Ministries (GGO), stating that all parties to be heard must be involved in due time, were repeatedly ignored.” It is completely unacceptable, she indicated, that a legislative proposal resulting in “massive interference into the fundamental rights” of citizens which affects “absolutely core issues of data protection” is conducted virtually without their participation. The controversial issue of data retention will not be voted on until after the Bundestag’s summer recess, said Social Democratic Party leader Thomas Oppermann on Tuesday (9 June) while attending a meeting of the SPD faction in Berlin. The earliest possible date would be in September, the faction indicated. Data retention will be discussed in the Bundestag for the first time this Friday (12 June). But as of yet, there is no official schedule for continuing the parliamentary procedure. Still, there has been talk on various occasions indicating that a Bundestag resolution could be reached in June, or July. 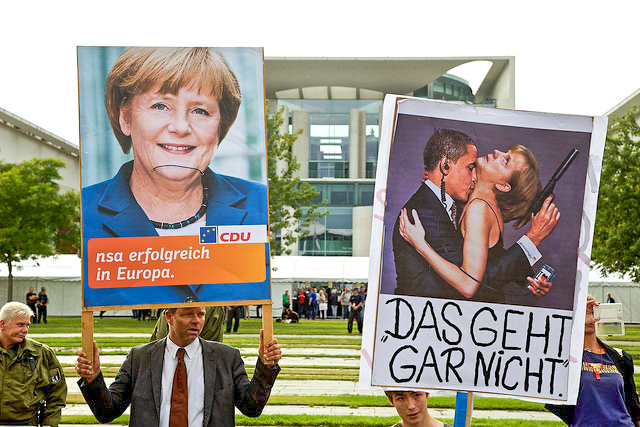 The Green Party is among those criticising efforts to reintroduce data retention in Germany. In response to Oppermann, the Greens Parliamentary Chairman Britta Haßelmann explained on Tuesday that it amounts to “an unacceptable interference into civil rights”. She welcomed the later approval date. In this way, the SPD is accommodating her party’s calls for a real consultation procedure with extensive debate and a committee hearing, she said. There is also opposition to the planned legislation within the SPD. It is expected to be a topic for debate at the SPD’s party convention on 20 June. Several proposals indicate hopes to forego the revision. With a national effort on the retention of telephone and internet data, the German government hopes to end years of political conflict over the issue. On 27 May 2015, the Federal Cabinet signed off on a bill drafted by Justice Minister Heiko Maas to introduce a storage obligation and a maximum retention period for traffic data. The bill plans to allow data retention for up to 10 weeks, rather than the original period of 6 months planned by the European Commission. The decision was preceded by a compromise between Maas and Internal Affairs Minister Thomas de Maiziere. While Maas' Social Democratic Party (SPD) has tended to reject data retention for data protection reasons, the centre-right alliance and all German security agencies consider this measure a necessity in fighting crime. please let me thank you for your both kind and logical communication to me, as I’ll always need these encouragements from the official representatives of a nation I strongly intend to start visiting, in the closest time possible. Contrary to these, please let me ask you to confide a lot more both in my formal and informal studies with my personal life experiences, as we’ve been taught by international and Romanian professors(respected Academics) about different statistics within our former classes of ‘International Economic Relations’ that I’ve been persuaded to complete with another (national, this time)Master in the Official Administrative discipline of ‘Expert in European Funds’, in 2014). In these circumstances, would you please try to appreciate my deep honesty when I confess to you and to your different Swiss colleagues and officials, that I cannot see from you neither a civilised sympathetically understanding towards me, as I’ve always proved to be a very special and unique professional woman in the hardest imaginable circumstances, ever; nor a proof that your intellectual and always competitive foreign logic, could be a sign of authentic professional thinking. Please let me add that opposite my very private, unusual for you(and Academic national) ethics, added to the self-respect that have started to make me refuse to do compromises with my body and spirit since I’ve been 25(when I had my last intimate contact, ever, contrary my continuous health, need, will and repeated attempts for having straight and upright relationships with bright healthy professionals like I am, always), there have never been any from your single foreign Officials into my country, to demonstrate both the mental with physical health and the superior and mature education, true willingness and experience, to start offering me in person(and also in private), for my continuous private honesty and for my lack of private experience, as a woman. In these circumstances where both you and the Romanians keep on refusing to reach my expectations as I am a bright and never-penal upright woman who was born in the same day with the Romanian President mr.Klaus Iohannis(in 1979, my case), would you please understand it will always be your fault for these complex aggressive actions to me, as I have chosen long years ago in my young life, to take you as a model of effective behaviour within the daily events, everywhere. Opposite to these, I accuse you of violation of my human and female rights and I’m also charging you with the repeated neglect of my Romanian Constitutional civilian rights and my very high legal status, as I’ve always practiced my education and I have wasted both my childhood and my entire youth to honestly become a ‘ ISCO 08′(http://www.ilo.org/public/english/bureau/stat/isco/isco08/index.htm), contrary both your continuous foreign and Romanian hostility to see me as a private professional and young healthy and no-ethnic white-Caucasian intellectual woman, has always kept me apart from trying to make additional compromises with your unaccomplished(‘ incult si neexperimentat’or Protestant, maybe??) actions to me, which have always proved to be destructive for my well-being. All in all, as personal values are known to have effect on human behaviour when I was taught that contrary the’ culture is symbolic and arbitrary’ and ‘not created or dictated by natural laws’, it ‘defines rules for acquiring and transferring information; it standardizes perception, it defines attitudes for intra-group and extra-group relationships’ and ‘it sets the institutional parameters that condition human behaviour and stabilize social systems’. As you shall have the healthy condition to ask for more details from me personally, please be so kind and send me the information about what I should do more, in order to fit your expectations, as I shall always prove we could both benefit, from our complete communications. please let me thank you for your kind and logical communication to me, as I’ll always need these encouragements from the official representatives of a nation I strongly intend to start visiting, in the closest time possible. Contrary to these, please let me ask you to confide a lot more both in my formal and informal studies together with my very private life experiences, as we’ve been taught by both international and Romanian professors(respected Academics) about the different international and national different statistics, within our former classes of ‘International Economic Relations’ that I’ve been persuaded to complete with another (national, this time)Master in the Official Administrative discipline of ‘Expert in European Funds’, in 2014. In these circumstances, would you please try to appreciate my deep honesty when I confess to you and to your different German, Austrian and Swiss colleagues and officials, that I cannot see from you neither a civilised sympathetically understanding towards me as a top professional trustworthy(not-corrupted) and single woman, as I’ve always proved to be a very special and unique professional female in the hardest imaginable circumstances, ever; nor a proof that your intellectual and always competitive foreign logic, could be a sign of authentic professional thinking. Please let me add that opposite to my very private, unusual for you(and Academic national) ethics, added to the self-respect that has started to make me refuse to do compromises with my body and spirit since my 25th(when I had my last intimate contact, ever, contrary my continuous health, need, will and repeated attempts for having straight and upright relationships with bright healthy professionals like I am proved to be by the doctors but policy-makers and their corrupted voters, always), there has never been any from your single foreign Officials into my country, to demonstrate both the mental with physical health and the superior and mature education, true willingness and experience, to start offering me in person(and also in private), for my continuous private honesty and for my lack of private experience, as a woman. In these circumstances where both you and the Romanians keep on refusing to reach my expectations as I am a bright and never-penal upright woman who was born in the same day with the Romanian President mr.Klaus Iohannis(in 1979, my case), would you please understand it will always be your fault for these complex aggressive actions to me, as I have chosen long years ago into my young life, to take you as a model of effective behaviour within the daily events, everywhere. Opposite to these, I accuse you of violation of my human and female rights and I’m also charging you with the repeated neglect of my Romanian Constitutional civilian rights and my very high legal status, as I’ve always practiced my education and I have chosen to waste both my childhood and my entire youth, in order to honestly become a ‘ ISCO 08′(http://www.ilo.org/public/english/bureau/stat/isco/isco08/index.htm), And contrary both your continuous foreign and Romanian hostility to see me as a private professional and a young healthy and no-ethnic white-Caucasian intellectual woman, has always kept me apart from trying to make additional compromises with your unaccomplished(‘ incult si neexperimentat’or Protestant, maybe??) actions to me, which have always proved to be destructive for my well-being. All in all, as personal values are known to have effect on human behaviour when I was taught that contrary the’ culture is symbolic and arbitrary’ and ‘not created or dictated by natural laws’, it ‘defines rules for acquiring and transferring information; it standardizes perception, it defines attitudes for intra-group and extra-group relationships’ and ‘it sets the institutional parameters that condition human behaviour and stabilize social systems’. As you are not part from the idiot and continuously illegal-thinking ‘Left/Socialist policy in Europe, would you please start having the healthy condition to ask for more details from me personally, in exchange for money. So please be so kind and send me the information about what I should do more, in order to fit your expectations, as I shall always prove we could both benefit, from our complete communications.